Most sales processes include signing a document like a proposal or contract, when the deal is closed. In the good old days, we used to email that document to be signed, and our client would print it, sign it, scan it, and return it back. 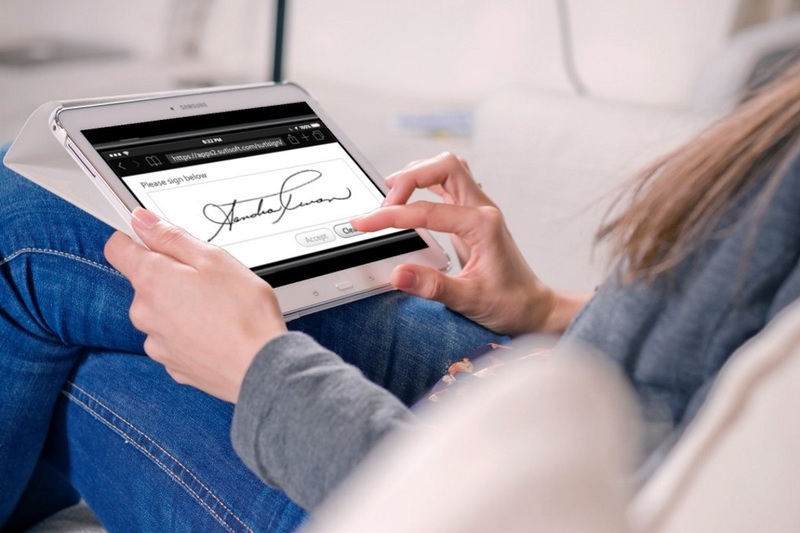 But today, whether you need to sign or get a signature from someone else, with online e-signature solutions you can create an electronic signature in a few clicks from any internet-connected device. With modern cloud-based solutions, it is very easy to create electronic signatures. All you need to do is to upload your sales document you want to e-sign (proposal, contract, quote, etc.) and draw your signature in the signature field—or just type your initials. And similarly, when you send it to your client, you just indicate who needs to sign it, and mark where they need to sign it. As simple as that! Signers receive an email link and can sign your document from their computer, tablet or cell phone. It's easier to use than paper, and it eliminates the costs & hassle of printing, scanning, faxing, and overnight delivery. Technically speaking, there are four ways to create an electronic signature, all within a few clicks or swipes. By Finger On The Screen: When you’re signing on a mobile device or tablet, you can simply use your finger to create an electronic signature directly on your document. By Uploading A Picture: Whether on your computer or mobile device, just upload a picture of your paper signature and overlay it on the signature field. By Drawing With Your Mouse: If you are on your computer, you can simply draw your signature with your mouse to create a unique electronic signature. By Typing Your Name: Most e-signature software comes with handwritten fonts. Once you type your name, you can just select a font that best matches your paper signature. Most of us mistakenly think that the old fashioned handwritten signatures are the safest way of identifying a person. But today, electronic signatures carry the same weight and legal effect as traditional paper documents and handwritten signatures. And when it comes to safety and security, with cloud based replicated and encrypted storage, modern electronic signature software is much safer than signing documents on paper. There are so many reasons why you can sell more with e-signatures, but one of greatest benefits is that it also enables you to instantly collect your payment online, right after your client signs your sales document. If your e-signing solution integrates with online payment systems like Stripe, Square or Paypal, you can automate your collection process and shorten your sales cycle. Global e-signature market is rapidly growing and it is becoming the standard business practice to e-sign documents. You might be concerned about how your customers will react to this new experience, but since it saves time and leads to faster decisions, your clients will most likely appreciate e-signing your documents. Just make sure to inform them about how the process looks like and show them how they can sign the documents. Most of our clients dramatically increased their close rate and shortened their sales cycle. So go ahead create your electronic signature and send your first sales document today!